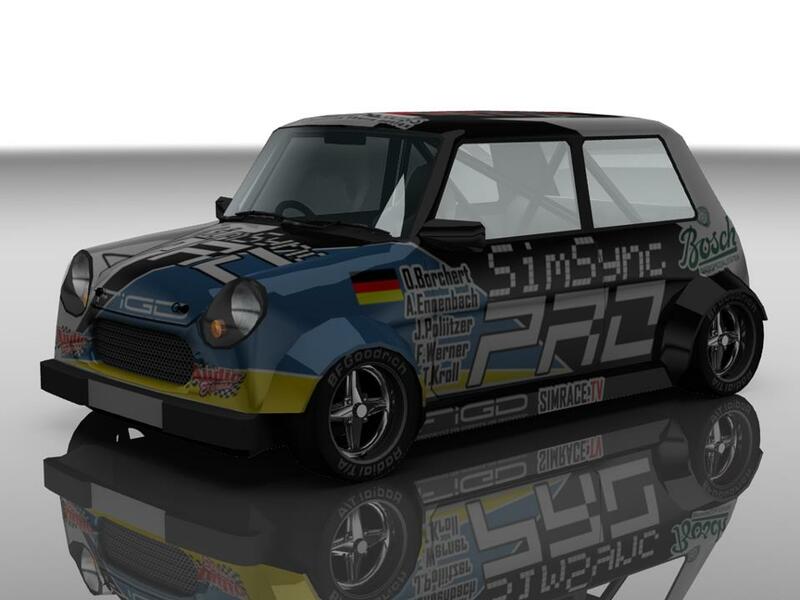 The SimSync PRO Racing Team finished on Position 8 in the Desire of Patience 24 at Aston Historic (LfS). Thanks to our team members Thomas Kroll, Fabian Werner, Olaf Borchert, Joachim Politzer and Achim Ennenbach, we were able to reach this fabulous result. We are proud of you! After a curious start, where we had to start from the pit instead of the grid, Achim could do a good performance and brought the car from P19 up to P9 by mainly overtaking the slower class cars. Due to a spin, he lost P9 and was in P10 again. Another mistake in lap 20 damaged the car to much to continue without repair. So Achim went to the pit to let the car repair and to swithc the driver seat with Joachim Politzer. Joachim took over the car from Achim at P15 due to the long repairing time. After about a racetime of 2 hours, Joachim is back on P11 and only about 17 sec. behind the car in front (Team a*u*a). After an mistake of them, Joachim is now only a seconf or two behind P10. We’re fighting! Looks like the positionslist in the viewer is wrong. The scoring list below the viewer should be correct. So we are no in P11, about 20 sec. behind aua from Team.a*U*a and Olaf is closing constantly the gap with very fast laptimes. Team aua just pitted (lap 67), so we got his place (P10). Lap 78 and Fabian takes over the seat from Olaf. Fabian drives his first stint in his very first 24h endurance race. Good luck Fabian and keep pushin’! Lap 97 and we are on P10. Fabian is pushing very hard and drives faster than ever before. Now he is about 17 sec. behind P9 ( -[BC]-Team The Best) and is constantly closing the gap. Great performance, Fabian! Thomas Kroll took over from Fabian in lap 107. Go and get them, Thomas! Achim had a good stint with fast laptimes and could close the gap to the cars in front. Joachim closed the gap to position 8 up to less than 15 seconds. Then unfortuanelly there was a misunderstanding with a car fromt the other class. After the crash the car was so much damaged, that we had to pit and lost a lot of time. Joachim leaves the pits on position 12 with a gab of nearly 3 minutes to position 11. During his stint he closes the gap to about 1:10 minutes. Unfortuanelly he entered the pits a little to fast, so we got a drive-through-penalty. Seems not to be his day……..
Fabian is currently in the car. He’s closing the gap about 2 seconds per lap to the car in front of him, and there is still a lot of time to go……. Fabian just overtook the -[BC]- Simler Team and we’re now back in P11. Great move! Lap 233 and Olaf takes over the car from Fabian. Go Olaf, GO! Thomas is driving his second stint and we are back in 11. Currently he is about 8 seconds behind p10. Achim just finished a double stint. He was able to push the car to the limits (new personal best time of 1:41:31) and to catch another position. We’re now in P10, one lap behind P9 and about 2 minutes ahead of P11. Joachim has now taken over the seat and he’s giving everything to shorten the gap to P9. Go Jopo, Go! Joachim also finished his stint. He was able to reduce the gap to about 1:30 minutes to P9. Now Olaf has taken the seat and is willed to reduce the gap also. 392 laps completed now and we are in P9. Olaf is currently driving our car. The gap to the car in front is still around 1:30 and we are about 1:25 in front of the car behind. 04:50 Only a lap or 2 after getting back P9, Achim got a disconnect too … Olaf is taking over and we are in P10 again with about a minute behind P9. The team on P9 did a pitstop and Olaf is closing the gap very quickly. Get him, Olaf! Olaf just overtook the car of the GDC team. We’re back in P9. Great move, Olaf! Due to an impact, Olaf lost P9 and GDC is now ahead of us. Achim took over from Olaf and closed the gap to P8. Because of a heavy accident, the car was to much damaged to continue. We had to jump into the pit to get a new car. Olaf again took over and is currently battling with “Team aua” for P9. Fabian took over from Olaf. Due to the reason that one team had to retire, so that we are now in P8. With fast times he is closing the gap to GDC lap by lap to go for P7. With actual 45 seconds gap and less an hour to go, it looks like the battle is decided. But Fabian will not give up……. Fabian managed to reduce the gap to 31 seconds by crossing the start/finish-line. Great Job guys, thanks a lot for the race and the performance. Thank to all fans and spectators for crossing their fingers for us.